When I see an error at Ancestry.com, I usually take the time to report it. Sometimes I do this just because I might want to find the item again and I would like for others to be able to find it as well. I never keep track of how long it takes for these corrections to be "updated," although Ancestry.com sends a notice when that has happened. I noticed that my uncle Eielt Janssen Ufkes was indexed in the World War I Draft cards at Ancestry.com as Eielt James. I made the correction. I have no idea how long ago it was submitted, but today I got an email that it had been added. I'm glad that Ancestry.com is adding corrections, but I'm not certain why it takes so long. As mentioned in an earlier post, Ancestry.com just released the set of Florida state censuses 1867-1945 on its website. I found cousin Martin Fecht in 1945, apparently with a different wife and two new children. He still is operating a gas station in Dade County, though. The nice thing is that the 1945 census provided his address. Ancestry.com just released the set of Florida state censuses 1867-1945 on its website. I actually found a cousin of my great-grandfather in the 1935 census for Dade County, Florida--Martin Fecht. I split his entry over two images, but he is s hown with his wife Gladys and children, Billie and Harlan. On the second image, his family's four entries start with the one where the husband is born in Illinois. I was not aware that he ran a service station and I did learn that he must have gone to school through the eighth grade and that his wife graduated from high school. Readers with Florida ancestors can search the Florida state censuses 1867-1945 on Ancestry's website. My recent Tips from the Pros on the Ancestry.com blog mentioned getting responses from your trees that are posted to their site. Apparently some are having difficulty with the address I gave. I think I know what the problem is, but will get confirmation and post that. We don't want people missing out on connections. Call me confused. I think. I have been working with the New York Passenger Lists, 1820-1957 at Ancestry.com. I searched for Mueller, using the "exact" option and choosing "United States" Soundex. I got 27, 456 hits. I searched for Miller, using the "exact" option and choosing "United States" Soundex. I got 131, 856 hits. Why the difference? Mueller and Miller are Soundex equivalents. Or am I missing something? I guess what I was missing was that to get the same number of results is to leave the "exact" box unchecked with the last name when doing a search for Mueller and Miller. In both of these cases, I get 314,500 matches (Mueller last name unexact), US Soundex Search. I also get 314,500 matches for Miller, last name unexact, US Soundex Search. I am guessing that 314,500 is an estimate rather than an exact number. I search for Bernard (first name, exact), Mueller (not exact), US Soundex--I get 318 results. I search for Bernard (first name, exact), Miller (not exact), US Soundex--I get 316 results. We have posted a list of mortality schedules that are currently available at Ancestry.com. Sometimes you still have to do it the old-fashioned way. On the city directories at Ancestry.com, I performed the search as shown on the screen--Cawiezell as the last name, unexact, living in Davenport, Iowa. There were seven matches, some of which are shown in the image. None were for the last name of Cawiezell. When browsing manually Stone's 1888-1889 Davenport, Iowa, directory, I located the following entry for several Cawiezells, all living with Maria at 1019 W. 8th Street. I am assuming that Josephine is not the kind of stripper that might first enter someone's mind. It is always a good idea to search the directories manually if you think the family lived there and they are not in the search results. In fact, there should be Cawiezell entries in every directory from ca. 1855 for Davenport. So I'll have to keep looking. My wife descends from the Cawiezells. This directory is one of thousands recently posted and indexed on Ancestry.com.The city directories at Ancestry.com can be searched there. I will be posting more about my work in these directories as time allows. What is "W & D" in Rock Island in 1888? The 1888-1891 directory for the City of Rock Island contains entries for August and Charles Mortier, both of whom are working for "W & D." Anyone have any idea what company this is? This directory is one of thousands recently posted and indexed on Ancestry.com. The city directories at Ancestry.com can be searched here. Santa Claus is living in Saline County, Missouri in 1930 and appears in the census image at Ancestry.com living with Mrs. Claus--in this case Mabel. This Santa was born in Missouri and worked in river construction. Just slightly different from working in the manufacture and delivery of toys. Readers can search the 1930 census for their own ancestors at Ancestry.com. Ancestry.com just released Ontario, Canada Voter Lists, 1867-1900 on their website. I was really excited as I was hoping to find my elusive Clark Sargent in this database. So far no luck. I searched for just the last name Sargent, just the first name Clark and later on I will experiment with additional spellings for the last name. Maybe he is just hiding somewhere. Ancestry.com indicates the areas that are included the Ontario, Canada Voter Lists, 1867-1900 and I should also look to make certain all areas are covered. It is always possible that the entire set of records is not extant. One should not assume. One of these days, I will hopefully find Clark. In the interim, perhaps readers will have success with this database. Varmland, Sweden Parish Records Added to Ancestry. Ancestry has parish records from Varmland Sweden from 1661-1895. This is excellent news for the Swedish genealogists with roots in this county. Those with Swedish ancestors know that records from this country are detailed and cross-referenced (some would say they were just a little compulsive). The records from Varmland cover the 81 parishes of that county. To see the list of parishes, visit the Ancestry.com page for Varmland Sweden. All church records are included, christenings, marriages, funerals, household clerical registers, communion registers,etc. Now for them to put Ostergotland up. Then I never will get any work completed. The city directories on Ancestry.com.are not like the older ones were. This is easier to notice when you search for names instead of browsing through the towns individually as I originally did. The first screen shot shown in this post comes from the results when I searched on the last name Mortier. I found several references I already had and some new ones. One struck my interest. It was for Mrs. Louisa Mortier. In viewing the entry, I had to be careful and look beyond her name. The temptation might be to just copy that one name and leave it at that. At least in this image, I do have enough of the source to see where the information was obtained (look at the "crumbline" in the upper part of the screen. What is missing in this entry is who these people are---what their occupation or business is. Any entry must be viewed in context. Resizing things just a little, we can see that Mrs. Mortier appears in the lists of Boarding Houses. The one thing I did not originally make a note of was whether her boarding house was in Rock Island or in Moline. In directories that combine more than one location in a boo k, but separate the entries by city, this is important. I should somehow notate that this list is for Rock Island. The directory contains all the Rock Island entries then contains all the Moline entries. My search results did not find August in the same year. I wondered why this was. To the best of my knowledge he did not return to Belgium, but anything is possible. I decided to perform a manual search of the directory for August and was not disappointed. When I looked at the page for the Mortiers, I realized why their names probably were not returned when I searched. There is a black line running down the page. There is a reasonable chance this interfered with the OCR scan of the text. August is Louisa's husband and Kamiel is his brother. Other records had not indicated she had operated a boarding house, not even the census. I learned a little more than I expected, after all I was just looking for examples to illustrate a blog entry. Ancestry.com says it is new, but I'm not certain how new the U. S. City Directory collection actually is. The search may have been changed or a few cities/locations might have been added. An admittedly quick scan of the locations and places included seemed to indicate that this database is the directories that were uploaded several years ago in an attempt to make up for the lack of the 1890 census. The city directories can be searched here. I would be interested to see if others think this is the same set of data that was already on Ancestry.com. Ancestry.com has added U.S. Marine Corps Muster Rolls, 1798-1940 to their list of searchable databases. I actually think they have updated this offering as I remember searching it before. The first image shown is for Chris Goldenstein, shown as a Corporal in November of 1927. This listing gives his hometown of Golden, Illinois. This would have been helpful if there had been several Chris Goldensteins who were in the Marines. Fortunately there were not. And the town of Golden, Illinois, was not named for his family in case anyone was wondering. Not all the listings provide the name of the "home." Searchers will have to search every muster listing to ferret out all possible clues. Mr. Goldenstein's listing from December of 1931 does not provide as much information. Uncle Chris was not a career marine. His brother, Jurgen was. Two of the muster listings for Jurgen are included here in this blog post. There are numerous muster listings for Jurgen given the amoutn of time he was enlisted in the marines. The first shows Jurgen at Quantico and the second shows him stationed in China. The U.S. Marine Corps Muster Rolls, 1798-1940 can be searched at Ancestry.com. I've been doing a little bit of work on my wife's French-Canadian lines using the Droin Collection atAncestry.com . This image is this posting is from 1815 marriages in St. Constant. Alexis Robidoux married Rose Rheaume. Even those who can't read the original can see their names on the left hand side of the entry. Ancestry.com has indexed these records, but just the names of the couple getting married, the person who was born or died only. Many other names are mentioned, but these are not included in the index. 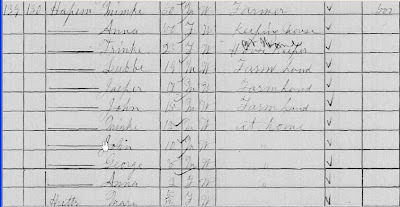 However having these records online with even this index is a wonderful help for those with ancestors from Quebec. Especially since you do not have to leave home to conduct your searches. Ancestry.com has newspapers on its site in addition to those newspapers on Genealogy Bank. One site complements the other. Searching on only one site may cause the researcher to overlook references. The image with this post comes from the Ogden Standard Examiner from 15 February 1931. The pictures shown are William Henry Price (top), killed in late 1930 in Kansas City, Missouri, and Ben Siebels, killed in Tyro, Kansas. The article from the Examiner focuses on the kids involved in this crime spree with additional details not given in many of the other accounts. In this case, many of the newspaper articles were pretty much repetitive, but a few follow up pieces done a few months later contained information not originally published. The article's headline is included here as well. I'm not including pictures of the "cradle mob," but they appear in the paper as well. It always to visit more than one source. The Ogden Standard Examiner is online at Ancestry.com (at least partially). The last two articles I've written for the Ancestry.com blog have focused on using their German geographic finding aids. The first one was an overview of using Meyers Orts and the 19th and 20th century topographical maps at Ancestry.com. Those who have never used Meyers Orts might want to give the article a look as it provides a few examples and suggests additional finding references to help the user when working with these materials. I forgot to mention in my previous post that Soundex capabilities will also eventually be coming to the new search interface at Ancestry.com. Yeah (again). One of the things I miss in the new search experience at Ancestry.com is the map that allowed one to browse the databases geographically. Sources tell me this will return. No time frame, but it is in the works. Yeah. Soundex on New Search at Ancestry.com? Is it just me? Or have they taken away the Soundex search at Ancestry.com? I cannot see it on the newly released Washington Deaths 1891-1907. Mark me down as confused, at least partially. And mark me fully down as irritated. I searched on Ancestry.com in their new search for John Ufkes. I used a year of birth as 1838, plus or minus two years. The screen shot is as shown. I did have the death year of 1924 listed as exact. Apparently that is why no census results were returned for John. When I searched for John Ufkes with only a year of birth as 1838, plus or minus two years, I obtained several results (mostly from census records)--as shown below. I understand that my original search required the death year of 1924 to match. However, census records (sans mortality schedules) typically do not have a year of death with which to match. It seems to me that census results that match the year of birth should be included, regardless of whether an "exact" match on the death date is indicated. It must be necessary to leave the death date blank to bring up census records. Urgh...now I have to search several different ways for one person. I thought new searches were supposed to be improved. (sometimes I think they should take a lesson from the "new Coke"). It seems logical to me that a search of records that do not include any death dates should not require the death date to match, even if I indicate a matched date in my searches. But then it has been nearly two decades since I had "sets and logic." Maybe the rules for logical have changed. I still like the old search better. These are really nice maps. A sample image has been placed here. It is from the 1901 map for the Aurich area, but only Holtrop and the surrounding area is shown. This is where several of my families lived in the 1860s and before. The "overview map" has also been scanned and is where users should start and indicates what pages of the map contains what areas (click on Übersichtsblatt to get the image--it is large). We will be posting additional suggestions for using the maps, but I wanted to make blog readers aware of their availability on Ancestry.com. I'm hoping to have more time to really get into these maps over the next few days. Blog readers who do not have a subscription can get a free trial at Ancestry.com and do some experimentation. Ancestry.com also has Meyers -Orts on their site as well. The 1825-1865 Illinois State Census have been released on Ancestry.com. The images here are a quick shot of the entry for James Rampley in Hancock County, Illinois, in Walker Township in 1855. The right hand side of the entry indicates James had a cooper's shop and that 4 in the household were eligible for the militia. The other numbers have to do with the amount of production from the family's farm. Those with family in Illinois during the time period can search The 1825-1865 Illinois State Census for their own family. All of these census records are head of household enumerations only. They are also on microfilm at the Illinois State Archives and the Family History Library. ISA does have some indexes, but they are not available online. We've made some minor changes to our set of "quicklinks" to Ancestry.com. Anyone with suggestions for additions, etc. can contact me at mjnrootdig@gmail.com. As with many of our pages, we are focusing on content and "getting there," not wasting time on making it "pretty." It always pays to know about about all possible ways to access a certain set of data. Not all search interfaces are created equally. The 1861 UK Census is a case in point. The screen shown first in this post is the search box from the 1861 English Census at Ancestry.com. Of course, to use this you either have to have a subscription to Ancestry's UK Census images of your own or use a subscription at a library. The nice thing about Ancestry's 1861 English Census search is that it does allow you to search on a variety of search terms besides just the name. Personally, when I was looking for my wife's Spanish born English ancestor, the place of birth was helpful. The search interface at FamilySearch.org does not allow for quite as many search parameters. However, it is free--a huge plus for many. A screen shot of the search interface for 1861 at FamilySearch labs is shown second in this post. There are some advantages to using Family Search as well. Personally I like to use both sites because of the differences in the search interfaces. The microfilmed copy of part of the 1870 Census for Northeast Township, Adams County, Illinois, is like looking at pea soup fog. One cannot make out anything. FamilySearch now has added their own 1870 census images to compliment those at Ancestry.com. This image (the one with the grayer background) comes from FamilySearch. The image from Ancestry in the 1870 census is also shows on this post. Both are significantly better over the microfilm, which I gave up reading many years ago. Family Search's image and indexes will be free when they are posted in their entirely. Ancestry's require a subscription. However, one may read names differently or "catch" someone the other does not. The "hints" in your tree at Ancestry.com can be helpful. The screen shot to the right shows the three hints that appeared for my grandpa Neill's brother, Ralph, born in 1905. The SSDI reference was dead on and the 1910 census record was the right one too, even though it is indexed as "Mill" instead of "Neill"
Bear in mind when attaching these to your tree make certain you choose "alternate" fact where appropriate and always view the advanced options as mentioned in our preceding post. I normally don't attach from the trees, but that is just my personal preference. Ancestry.com redesigned some of their pages. I'm not certain what my opinion is, but if it keeps them getting subscribers and digitizing more things, then that's a good thing. Finding things on Ancestry.com occasionally frustrates me, I did like the census links on the main page. So I did what I did before...made a really cheesy page with links to Ancestry.com databases that I use the most often. It is NOT fancy, it is not eye appealing, but it gets me where I want to go without going through the navigational structure. Saving time is my goal...not getting an award for web design or being "pretty." I'll add more links to it, but only to things I actually use. You can partially customize links on the Ancestry.com page, but I have too many things I use on a regular basis to make that practical. And besides, I like CONTROL. And making my own pages gives me that. Consider doing it for yourself. No more real opinion on the pages---there's work to be done. One of the neat databases at Ancestry.com is the 1925 Iowa state census, which includes names of parents, including maiden name of mother. The database allows for searches on parents' names. The only drawback is that soundex searches are not possible on the names of the parents, only on the name of the enumerant. the ability to "mark" hits that have already been viewed. I don't always have time to get through all the hits on a search before I have to do something else. It would be nice to "mark" those that have already been looked at. the ability to make "notes" about a hit. I would settle for marking a hit as something I had already looked at, but adding a quick little note--even just 100 characters--that I could view later would be really nice. the ability to search all papers in one town (or one state) at once, without having to search the entire set of newspapers. Ancestry.com has several Davenport, Iowa, newspapers on their site. UPDATE: This can be done--you just have to be in the right place. A continued search of the newspaper on the Ancestry.com site located a picture of a relative of my wife. George K. Freund appears in the 20 July 1924 issue of the Davenport Democrat and Leader extolling his belief in the paper and the fact that he has been a long time subscriber and a long time democrat. Of course newspaper pictures are not as good as having actual photographs--the quality is not as high. However, if family does not have pictures, something is better than nothing. George K. Freund is a first cousin of George A. Freund, my wife's 2nd great-grandfather. Both men were Scott County, Iowa, natives born in the 1850s. Ancestry.com recently released the Droin Collection on their website. The indexing is not yet complete, but the project is quite impressive and a nice addition for those with French-Canadian ties. The image that is a part of this post comes from the Droin Collection and is the baptismal entry for Cesarie Robidoux. The entry is from St-Constant and is from the year 1827. Her parents are Alexis Robixoux and his wife Rosalie Rheume. Those wishing to use these records will need to brush up on their Latin. When time allows we will post a translation here on our site. Cesarie is my wife's 3rd great-grandmother. Cesarie's family settled in Clinton County, New York where she died. This was discovered totally by accident--which is how most things are discovered. A search on google just now for "bernard geissler" brought up numerous hits, including search results on Ancestry.com-the 6th result on the image shown in this post. This is the first time I have noticed Ancestry.com search results coming up on a Google search. Has anyone else noticed this? Ancestry recently released a database of California Voter's Registration lists 1900-1968. This is a good thing. But, I'm not thrilled with the search box. There is no soundex option, nor can I search for a specific year. Using a keyword will bring up that year and any person who has that "year" as a part of their address. Still too much to wade through for some names. I had several descendants of my third-great-grandmother I was hoping to locate, but the current search interface is weaker than most on the Ancestry.com site. Complaining here probably won't make a difference, but I feel better.